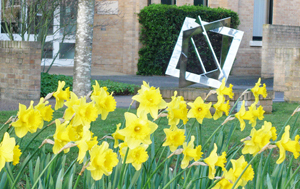 Daffodils and mathematical art outside the Isaac Newton Institute in Cambridge. Time, coffee, something to scribble on and others to chat to — these are the key ingredients necessary for producing first rate mathematics. And they are exactly what the Isaac Newton Institute in Cambridge provides. The Institute runs research programmes on selected themes in the mathematical sciences, with applications in a wide range of science and technology. It's a place where leading mathematicians from around the world can come together for weeks or months at a time to indulge in what they like doing best: thinking about maths and exchanging ideas without the distractions and duties that come with their normal working lives. The Institute celebrates its 20th birthday this year, having opened in July 1992. To join in the celebrations we bring you a selection of articles exploring some of the research programmes that have been held there. The Institute asked us to produce these articles in 2010 and we were honoured by being afforded this rare glimpse behind its venerable doors. And as you'll see, what starts out as abstract mathematics scribbled on the back of a napkin can have a major impact in the real world. Building bridges from mathematics to the city — Many people's impression of mathematics is that it is an ancient edifice built on centuries of research. However, modern quantitative finance, an area of mathematics with such a great impact on all our lives, is just a few decades old. The Isaac Newton Institute quickly recognised its importance and has already run two seminal programmes, in 1995 and 2005, supporting research in the field of mathematical finance. Renewable energy and telecommunications — When the mathematician AK Erlang first used probability theory to model telephone networks in the early twentieth century, he could hardly have imagined that the science he founded would one day help solve a most pressing global problem: how to wean ourselves off fossil fuels and switch to renewable energy sources. Taming water waves — Few things in nature are as dramatic, and potentially dangerous, as ocean waves. The impact they have on our daily lives extends from shipping to the role they play in driving the global climate. From a theoretical viewpoint water waves pose rich challenges: solutions to the equations that describe fluid motion are elusive, and whether they even exist in the most general case is one of the hardest unanswered questions in mathematics. Strings, particles and the early Universe — The Strong Fields, Integrability and Strings programme, which took place at the Isaac Newton Institute in 2007, explored an area that would have been close to Isaac Newton's heart: how to unify Einstein's theory of gravity, a continuation of Newton's own work on gravitation, with quantum field theory, which describes the atomic and sub-atomic world, but cannot account for the force of gravity. From neurobiology to online gaming — Artificial neural networks grew out of researchers' attempts to mimick the human brain. In 1997 the Isaac Newton Institute hosted a landmark research programme in the area. Today, neural networks are able to learn how to perform complex tasks and are crucial in many areas of life, from medicine to the Xbox. The shape of things to come — Progress in pure mathematics has its own tempo. Major questions may remain open for decades, even centuries, and once an answer has been found, it can take a collaborative effort of many mathematicians in the field to check that it is correct. The New Contexts for Stable Homotopy Theory programme, held at the Institute in 2002, is a prime example of how its research programmes can benefit researchers and its lead to landmark results.